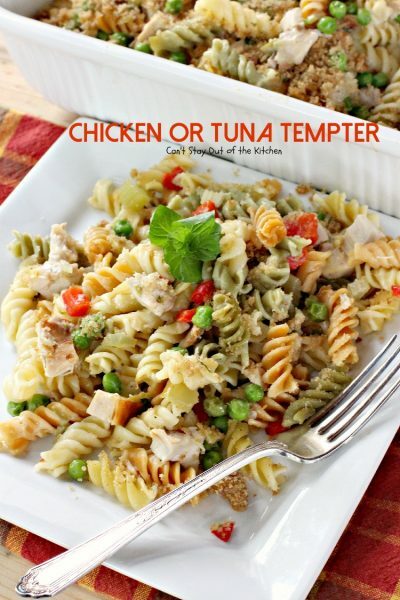 Chicken or Tuna Tempter is a family favorite. I love tuna casserole with any combination of veggies, noodles, and flavors. But, unfortunately, my husband doesn’t. He’ll eat tuna in sandwiches, but he doesn’t like it in salads or cooked in casseroles. So, when I found this fabulous recipe in a magazine years ago I would make it for my kids and me whenever John was working late or traveling. Then one day it finally dawned on me to try this great recipe with chicken instead! My husband loves Tuna Tempter–uh, Chicken Tempter this way! I’ve made some additions to the original Mueller’s recipe but it’s still really quick and easy to throw together. 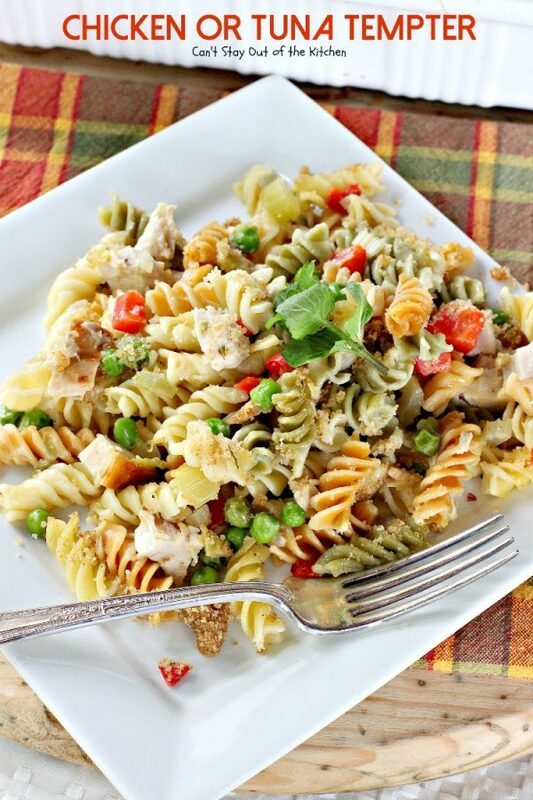 It’s also a great way to use up leftover rotisserie chicken or leftover grilled chicken. 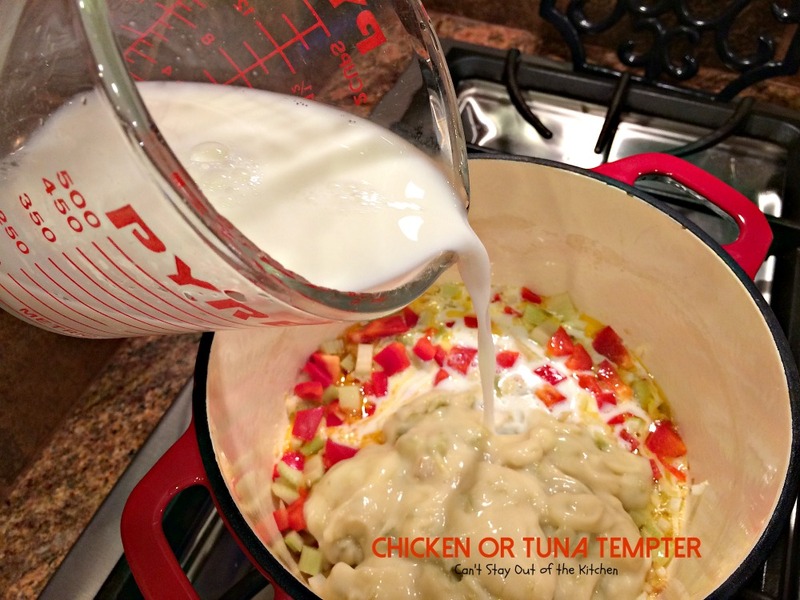 The creamy sauce is amazing and so simple even though it uses not-so-healthy canned cream of celery soup! I usually substitute fresh red bell pepper for the pimientos in the recipe but it is good either way. While this is good with dumpling noodles I’ve used just about any kind of pasta in this recipe including sea shells, rotini, and bow ties. While I added the peas to the recipe, it’s also good with peas and carrots or mixed vegetables of any veggie combination. If you’re looking for a quick and easy, tasty, kid-friendly casserole using either tuna or chicken, I highly recommend this delicious main dish. You won’t be disappointed. Not only that–it’s really economical. I used to always keep the ingredients for this recipe on hand so I could make it on a whim! 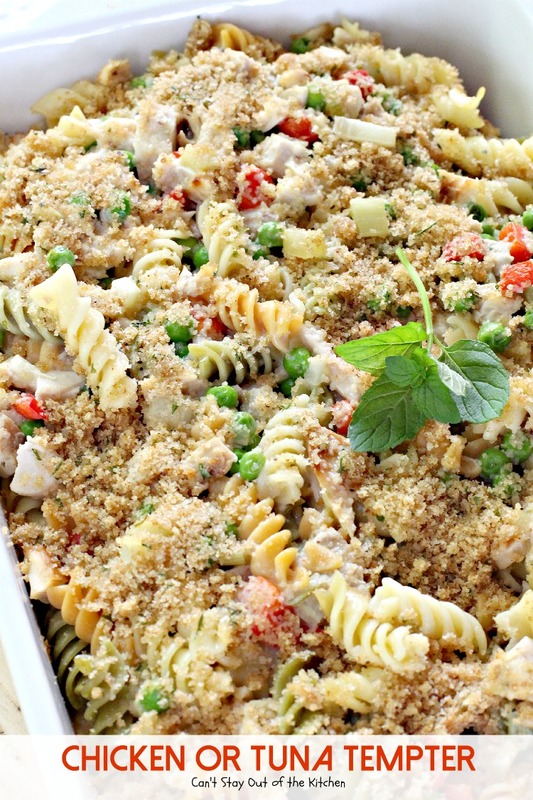 This is one of our family’s favorite comforting casserole recipes. I hope it will become one of yours too! When I initially posted this recipe in February 2013, it was before I had purchased my Canon, and I was still trying to figure out the best way to present pictures. I’ve been in the process of remaking all my old recipes (from the first year), so I could retake the pictures and upgrade them to be more appealing to you, the viewer. I recently remade this recipe for a friend who was down for the count with a bad back. I made a meal for her on the spur of the moment with no notice, so I just barely had all the things required for this recipe without making a trip to the grocery store. Thankfully, I had some leftover rotisserie chicken on hand that I used up and just enough peas and red bell pepper to make it work! It turned out wonderful, but this time I also laid off an excessive amount of bread crumbs so you can see the entree better. 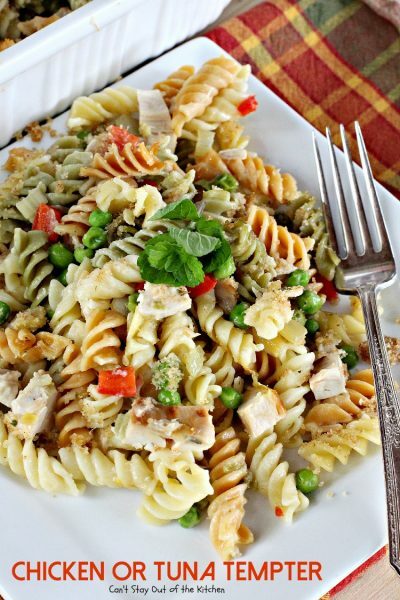 Whether you make this with turkey, chicken or tuna, it turns out delicious each time. 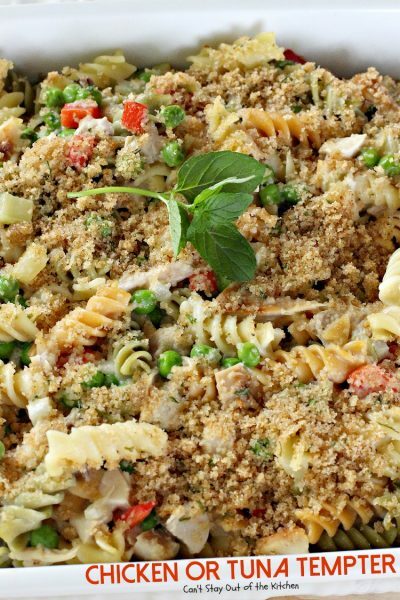 There’s lots of tasty chicken or tuna smothered in a creamy celery sauce with noodles and a bread crumb topping. Wonderful! Chicken or Tuna Tempter is SO easy! Especially if you choose to use tuna or canned chicken–you can whip the whole thing up and have it ready to bake in less than 20 minutes. Chicken or Tuna Tempter casserole is so delectable. You will love every bite. I used these ingredients. I had some leftover rotisserie chicken I was trying to use up for this recipe. After picking off all the meat I set it aside. However, if you use canned tuna or chicken you can whip up this recipe incredibly fast. You can also cook off 2 boneless chicken breasts and cut it down. If you do, make sure you save the chicken broth and cook your noodles in it. It adds so much flavor to the casserole. Place butter in skillet. Add diced celery, diced onion, diced red pepper or pimientos. Saute until vegetables are tender. Meanwhile, as you are sauteing the vegetables and making the sauce, cook the noodles. If you cooked off a chicken use the broth to cook the noodles in. The recipe calls for dumpling noodles. I used rotini-type noodles because I was making a double batch to give to friends and I was out of dumpling noodles. Add cream of celery soup and milk. Stir to combine. Remove from heat. The mixture is a little on the thin side but it thickens as the casserole cooks in the oven. In a large stockpot, cook noodles and drain. 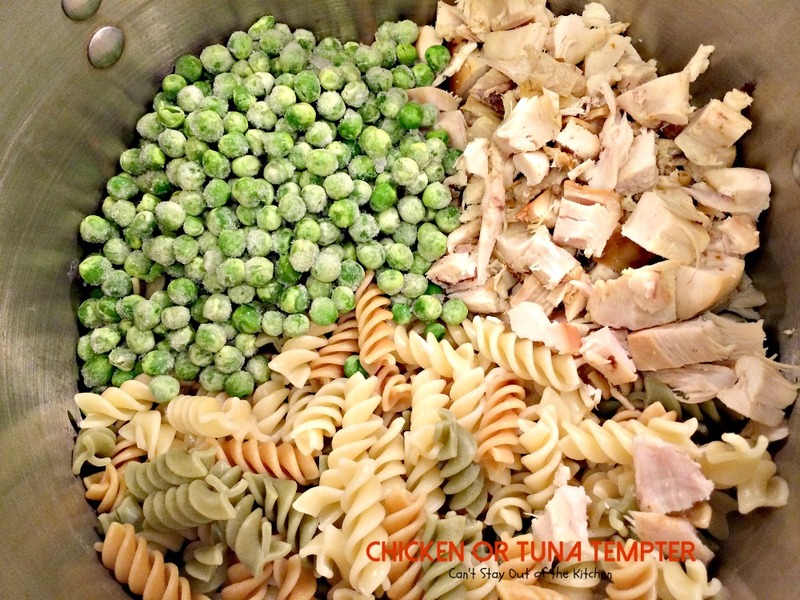 Add noodles back into the pan with peas and chicken or tuna. Add sauce mixture to chicken, noodles and peas. Stir to combine. Grease a 9×13″ glass baking dish. Pour combined chicken, noodle and sauce mixture into prepared dish. Melt remaining butter in a measuring cup or bowl. Add Italian-style bread crumbs and combine. Sprinkle bread crumbs over top of the casserole. Bake at 350, covered with foil, for about 30 minutes or until recipe is bubbly. 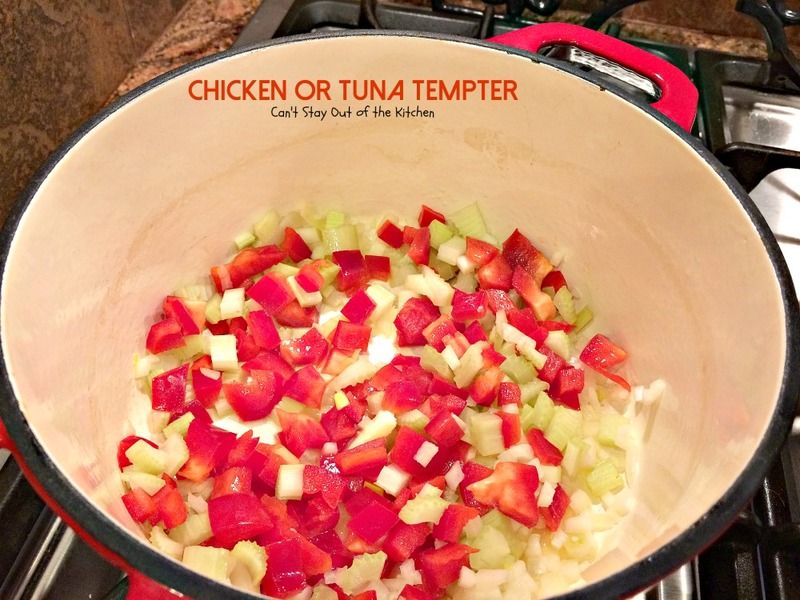 Chicken or Tuna Tempter has always been one of my kid’s favorite recipes growing up. They gobbled this great main dish up quickly! 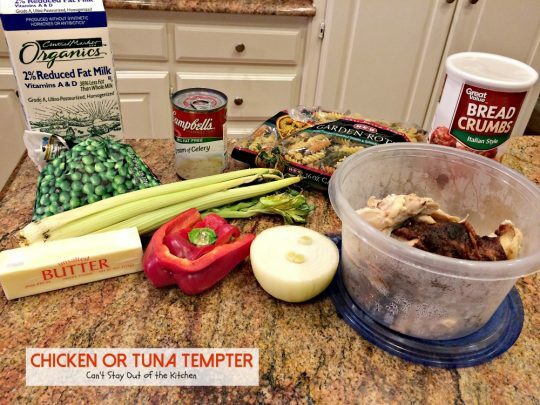 This Chicken or Tuna Tempter is so quick and easy to assemble. It’s economical too. Even your kids will love this fantastic chicken or tuna casserole recipe. 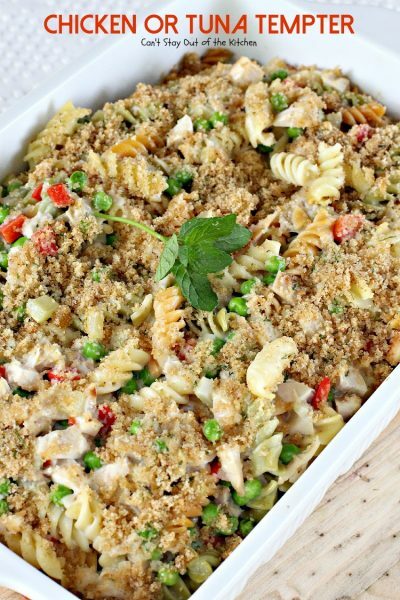 Amazing chicken or tuna noodle casserole recipe using peas, pimientos or red bell peppers, cream of celery soup, and buttered, seasoned bread crumbs on top. In saucepan, melt 2 tbsp. butter over medium heat. Add celery and onion. (If using bell pepper, add now). Stir in soup, milk, pimientos until blended. In 2-qt. greased casserole toss macaroni, tuna and peas. Pour sauce over macaroni mixture. Mix bread crumbs with melted butter. Sprinkle over top of casserole. Bake in 350° oven for 25-30 minutes or until bubbly. NOTE: Also very good with chicken or turkey (use about 2 cups). Recipe source: adapted from Mueller's pasta. Also very good with chicken or turkey (use about 2 cups). I’ve always liked to double the recipe and use a whole chicken cooked off. Then I use the chicken broth to cook the noodles in. It gives the casserole a richer, more flavorful taste. 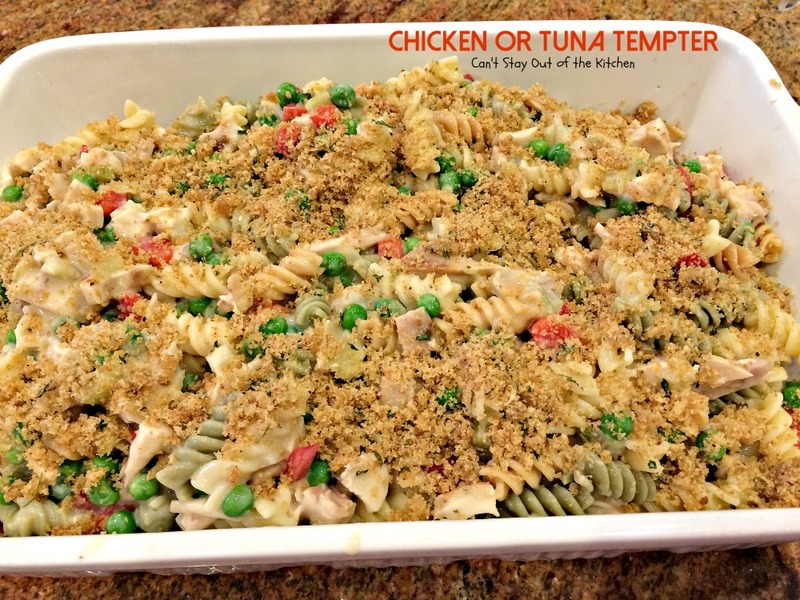 Chicken or Tuna Tempter is a great casserole to make for friends or to take to potlucks. I have made this just as many times with tuna as I have chicken. I truly enjoy it BOTH ways. My youngest son always referred to me as the “Casserole Queen” since I loved making casserole dishes when he was growing up. I still do. 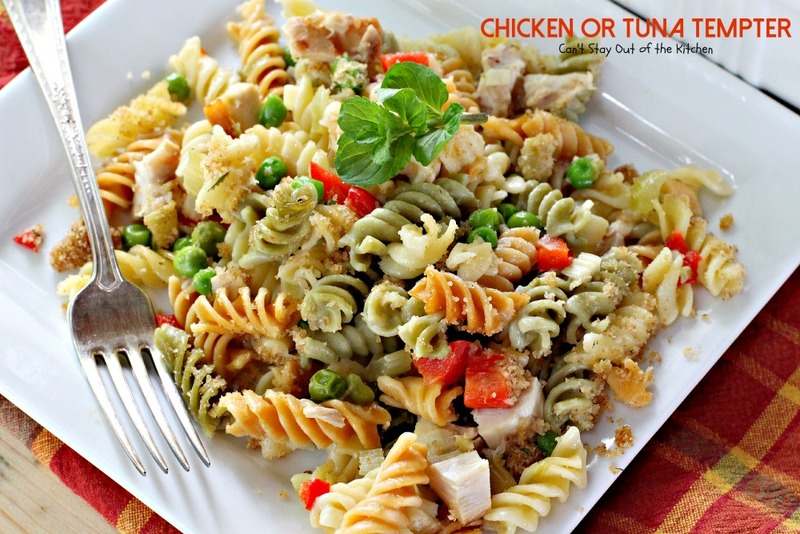 Chicken or Tuna Tempter has always been one of our favorites. Yes, it’s very easy and wonderfully delicious! I made this tonight! I a=didn’t have much time so it was perfect. 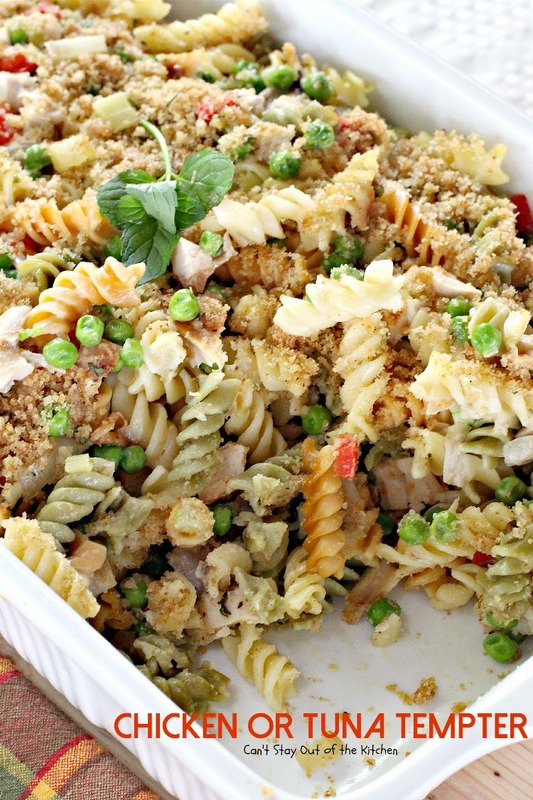 It’s probably the most delicious tuna casserole we’ve ever had. I made a few changes, like I used part of a jar of roasted red bell pepper, chopped and sauteed with the celery and onions, I threw in some Parmesan cheese with the noodles before I added the sauce AND instead of peas (because I didn’t have any), I added a can of black beans. 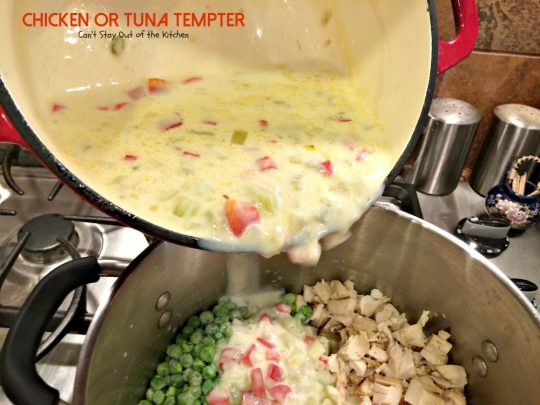 My daughter doesn’t like tuna casserole but SHE even liked this 🙂 Again, thanks for sharing! I never thought of making this recipe with beans, let alone black beans. Sounds fantastic. I’m so glad you enjoyed. We sure love the recipe. Everyone loves this at our house. 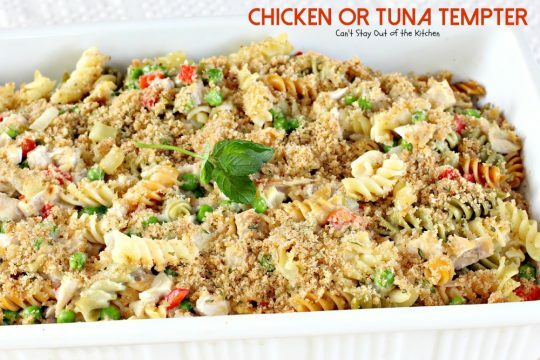 Tuna casserole or tuna bake always goes a treat. I leave out the veges and make them a side dish. 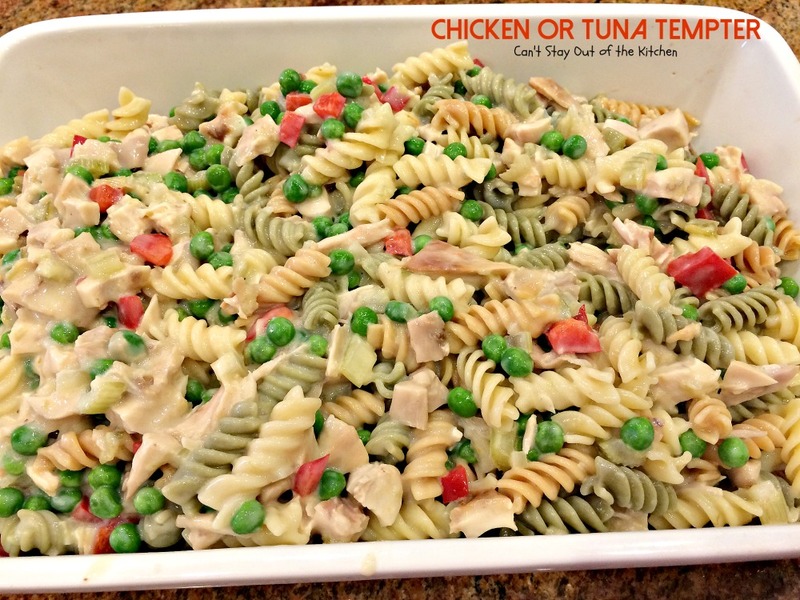 One son loves it so much he would eat the whole platter…I might have to try it with chicken, although I have lots of chicken recipes already, and this is a good way to do tuna. The taste is really amazing in this recipe. Give it a try sometime. Easy and delicious!